The Edge house was built in Boulder Colorado in August 2008.This Net Zero Energy Home was build with a high degree of care and attention to detail especially the thermal envelope, and the mechanical and electrical systems. It is a beautiful and inspiring home and a true show piece for green building. The house is LEED Platinum. The home was built in an established neighborhood, which in many ways makes it more environmentally friendly from a transportation and utilities standpoint. The proposed site had a large, 40 year old house that could not be remodeled, due to significant foundation problems and lack of southern exposure. The entire house was deconstructed and 91% was diverted from landfills. 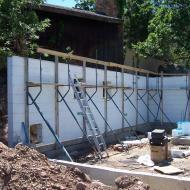 The basement and first floor walls were built using Insulated Concrete Forms (ICF’s). The second floor was constructed with 2×6 engineered lumber studs. These walls were then insulated with 2”of Icynene spray foam and also 3”of cellulose. 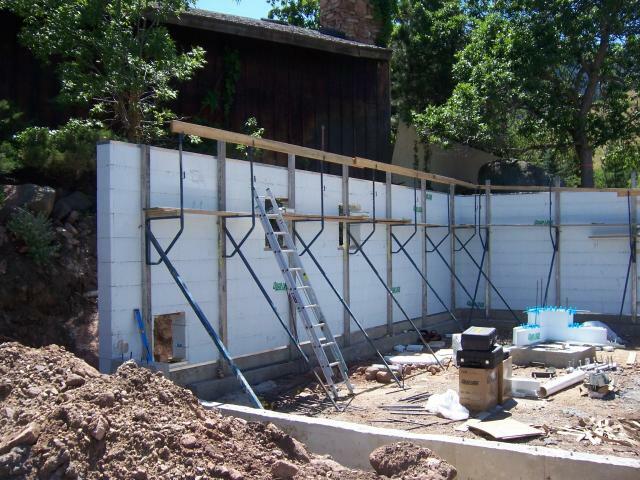 In addition, one inch of rigid foam insulation was then applied to the exterior of the wall for additional insulation and to help combat air infiltration. The house was designed with 4 ft. overhangs in order to combat excessive heat gain, especially on the southern sides. The architect, Scott Rodwin feels strongly that a home in a sunny climate like Colorado without overhangs cannot call itself “green.” Overhangs are essential when designing a passive home, and the biggest mistakes that architects make is not properly accounting for unwanted solar gains. The house has an open plan which strives to integrate indoor and outdoor spaces. Each room has at least two operable windows in order to promote natural ventilation. Rodwin had to balance the need for glass on the south side, with the need for view of the Rockies to the west. Balconies function to both shade these south and west windows. At the top of the stairs, in the center of the house is a 2” thick kalwall nanogel skylight. These revolutionary skylights have an R-20 and illuminate the interior of the home with an exceptionally high insulation value. The home also had a three story tall stone wall running through the core. This heavy thermal mass helps regulate temperature changes by slowly absorbing excess heat during the day, and releasing it at night. Indoor air quality was of key importance for this home. The MSDS (Material Safety Data Sheet) for every material and item that entered the home had to be carefully examined and approved. No formaldehyde or other toxin was permitted in the home. This sometimes proved challenging for the contractor, but resulted in an exceptionally safe indoor environment. The home has bamboo flooring, low flow toilets, concrete countertops and no-VOC paint. An infrared camera was used to locate any cold spots in the house. Some heat loss was found around the ceiling can lights and also in the plumbing penetrations. Some areas with blocking also needed additional attention. The home has a high-tech brain that help monitor and regulate energy use. Lutron sensors detect whether a room is occupied or not and adjusts the lighting accordingly. These sensors also raise and lower window blinds to minimize unwanted solar heat gain. This smart system will provide valuable information on the home’s energy performance. Landscaping was carefully designed to minimize water use. The lawn was about the same size as the master bathroom. A combination of gravel, mulch and sandstone pavers cut back significantly on the typical water use for a yard of this size. Xeriscaping is becoming more and more critical in Colorado in response to dwindling water supplies. This net zero energy home generates more energy than it uses and is built using green sustainable building practices. It is a home designed to impact the environment as little as possible. Its beauty, both on the inside and outside is inspiring and a showpiece for green building practices. Super-insulated envelope using a combo of spray in place foam, blown cellulose and rigid exterior insulation.